This is a great quick recipe that’s perfect for a light lunch or snack. I’ve used local lamb steaks from a farm just up the road so I know that the steaks are going to be full of flavour, for this reason I’ve married them with subtle herbs that will complement the steaks and bring the best out of them. Set the oven to 180°C. Start by rubbing a little oil on both sides of the lamb steaks and season with salt and pepper. Place a frying pan on a high heat and seal the lamb steaks for a couple of minutes on both sides. Remove from the heat and place on some kitchen foil about twice the size of the steaks. Chop the garlic cloves in half and add to the steaks along with the herbs. Fold the foil over the steaks and seal to make a little parcel. Place in the oven for about 15 minutes if you like the steaks still pink in the middle or up to half and hour if you like them well done. Times will vary depending on size of the steaks. While the lamb is cooking prepare the raita. Chop the cucumber into small cubes and add to the yoghurt in a bowl along with the chilli flakes. Slice the mint into strips and add to the yoghurt. Season with salt and pepper to taste. Garnish with a little more mint and a sprinkle with paprika. 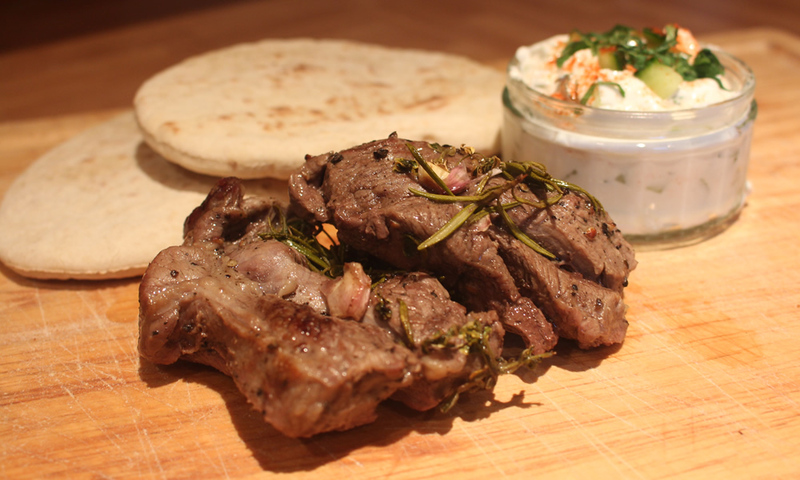 When the lamb steaks is ready, slice the steaks and serve with the raita along with some pitas.